When the housing market crashed, Tom Barrack was ready. He built a company that bought more than 30,000 homes across the country — including nearly 5,000 in Texas — and converted them to rentals. His rental empire includes nearly 5,000 homes in Texas – concentrated in suburban Dallas and Houston. Unlike earlier corporate landlords who built apartment complexes, the company that Barrack founded focused on three-bedroom, single family homes near good schools. In Texas, its homes average around 2,000 square feet and rent for $1,600 a month. Late Friday, one day after Reveal published an expose detailing problems in the company he founded, Barrack cashed out. He sold all the stock he owned in the company and resigned his position as co-chairman of its Board of Trustees. Nevertheless, Barrack, like other close Trump associates, now stands to cash in on looser financial regulations, which he is in a position to shape. “We’re just little people in his world,” Makita Edwards, 25, says of Barrack, the founder of a company now called Colony Starwood Homes, which owns the split-level neocolonial she rents in Atlanta’s eastern suburbs. Since Edwards and her family moved in last August, she says her life has been a nightmare. They went without heat in the winter and dealt with persistent water leaks. Two weeks after she moved in, Edwards was lying in bed with her 3-month-old son, Mason, when she said the ceiling caved in and the ceiling fan collapsed on top of them. Luckily, no one was hurt. 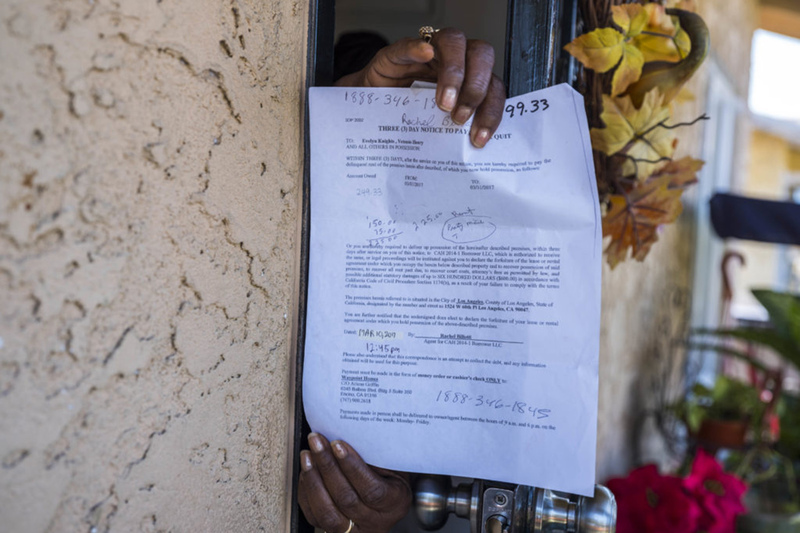 Tenants in dozens of homes in two of the company’s largest markets, Atlanta and Los Angeles, told Reveal from The Center for Investigative Reporting similar stories. Most of the homes were foreclosures, bought between 2012 and 2015. In many cases, the former owner, who lived in the house, was wiped out by the housing bust. Viewed from the outside, most of these houses look nice – set back from the street, with manicured lawns. Most are in the suburbs, in good school districts. But inside, many of the properties visited by Reveal look like they’ve been severely neglected. Like Edwards, others were struggling without heat and coping with leaky roofs. Residents faced peeling tile and collapsing counters. One tenant said she even dealt with a snake infestation. The company’s corporate filings show tenants churn through its Texas properties at a rate more than twice the regional clip reported to the U.S. Census. Turnover in Colony’s Houston-area properties was particularly high last year: 36 percent, compared to 16 percent in the region as a whole. In Dallas, 34 percent of homes changed tenants, compared to 16 percent in the region. Barrack, 70, is among the winners of the U.S. housing crisis, which washed away the wealth of millions of people. Since 2007, the single-family rental market has added 2 million units, the Census Bureau reports, even as the homeownership rate hit its lowest level since the Vietnam War. The “explosive growth of the single-family rental market has been a defining characteristic of the housing bust and recovery,” Patrick Simmons, director of strategic planning for the government-controlled mortgage company Fannie Mae, wrote in a report last October. Today, Colony’s rental empire spans at least 10 states – from California to Florida. In a speech to a University of Chicago real estate conference in 2012, Barrack – tall, fit, pacing the room like a motivational speaker – likened managing thousands of homes spread across the country to running a chain of McDonald’s restaurants or Kinko’s copy shops. An emerging body of evidence tells the other side of that story. For starters, while the company puts $19,000 into these homes when it buys them, according to the company’s annual prospectus released last year, it spent just $800 on maintenance per home in 2016. Nationally, the Better Business Bureau reports “a pattern of complaints concerning billing or collection issues (and) repair issues” at Colony-owned homes, which are rented under the trade name Waypoint. The litany of problems posted on the bureau’s website by tenants include broken air conditioners, flooding, mold and serious infestation. “When consumers attempt to reach the business regarding repair issues they report that the business is unresponsive,” the bureau said. The company claims high marks for maintenance, saying that in a recent customer satisfaction survey, it received 4.6 out of 5. “We are honored to serve the thousands of renters across the country who call our properties home,” Young said in the statement. In the heart of Colony’s largest market, however – Fulton County, Georgia – the Federal Reserve Bank of Atlanta found that corporate landlords were much more likely to file eviction notices than mom-and-pop landlords. Colony was the most aggressive, the report’s underlying data shows; in 2015, the company moved to evict a third of its tenants. In its statement, Colony disputed the study and said that most residents who receive eviction notices are never actually forced to leave. The company said it only kicked out 10 percent of its Fulton County tenants last year. The Federal Reserve’s researchers also found that the impact of the company’s actions wasn’t felt evenly across the community, either. In Los Angeles, Colony tenant Evelyn Knights received a three-day eviction notice over $49.33 in November. Knights, who is African-American, once owned a home in South Los Angeles, but she lost it to foreclosure after her husband died. Now she pays $2,125 a month to rent a similar bungalow 10 miles away. She said she was able to keep her home only after asking her church for help. “At that time, I didn’t even have $49.33,” she said. These notices, often over small amounts, confound housing experts because evictions are costly for landlords. The eviction notices came despite company screening processes that require verified employment and a history of paying rent on time. In essence, Colony’s aggressive approach takes good tenants and turns them into bad ones. More recently, Barrack’s attention has gone well beyond his rental empire. He’s been busy helping his friend and frequent business partner: President Donald Trump. The two real estate moguls have known each other for more than 30 years and been friends since Barrack brokered the sale of New York’s famed Plaza Hotel to Trump in the 1980s. Since then, they have joined forces on numerous occasions, most recently on Trump’s proposal to turn the Old Post Office in Washington, D.C., into a 263-room Trump International Hotel. Barrack bowed out after Trump said he didn’t need help financing the project. By then, Barrack was working full tilt to get Trump elected. He was one of the first business leaders to endorse him, shortly after the Iowa Caucus when most of the Republican establishment still backed Jeb Bush or Marco Rubio. After Trump became the presumptive Republican nominee in May, Barrack hosted one of the campaign’s first big-ticket fundraisers at one of his Southern California mansions. Barrack helped put at least $130 million into Trump’s campaign coffers: He raised $23 million for the pro-Trump Rebuilding America Now super PAC and, as chair of Trump’s inaugural committee, he raised $107 million more. When candidate Trump faced fraud charges and a class-action lawsuit brought by students of the now-defunct Trump University, Barrack found him a lawyer, according to the Hollywood Reporter. Recently, he’s been linked to many of the scandals involving the president. The New York Times has reported that Barrack introduced Trump to campaign manager Paul Manafort, now at the center of investigations into possible election-rigging by Russia. In May, The Washington Post revealed that Barrack also helped Trump’s son-in-law Jared Kushner avoid foreclosure on a 41-story Manhattan office tower that Kushner bought shortly before the bust. The New York Times has called Barrack “one of the few people whom Mr. Trump trusts.” On Feb. 21, after he and Trump shared a meatloaf lunch at the White House, Barrack told CNN they talk every day. There are signs that Trump is moving to help Barrack, along with other corporate landlords, who have benefitted from a decline in homeownership that continues to sag after the housing bust. An hour after Trump took the oath of office, his administration reversed a President Barack Obama-era rule that would have made mortgages backed by the Federal Housing Administration more affordable to borrowers who had good jobs but lacked enough money for a down payment – exactly the sort of people Barrack’s company targets to rent his single-family homes. The move was condemned by realtors and consumer groups, who argue that keeping these people out of the home-buying market, and in high-price rental homes like Colony’s could have an effect that goes on for generations. Barrack isn’t the only one in Trump’s inner circle who’s profited off the housing bust. Trump’s treasury secretary, Steve Mnuchin, has been called the “foreclosure king.” OneWest, the bank he ran from 2009 to 2015, was responsible for 40 percent of all reverse mortgage foreclosures during the crash. The bank is being investigated by the Department of Housing and Urban Development over whether it violated the Fair Housing Act by making fewer mortgages available to people of color and maintaining foreclosed properties in white neighborhoods better than those in black and Latino ones. Then there’s Steve Schwarzman, the chairman and CEO of the Blackstone Group, whose company bought even more homes than Barrack’s. He’s head of a special strategy group that meets regularly with Trump at the White House. The vice chair of that group is Jamie Dimon, the president and CEO of JPMorgan Chase, a company that has partnered with Colony to pioneer a new type of investment with a heavy dose of déjà vu. Lessons of the recession unlearned? A year after it bought the Los Angeles house that Evelyn Knights rents in a foreclosure auction on the courthouse steps, Colony bundled it along with 3,398 other homes across seven states, into a giant mortgage-backed security funded by JPMorgan Chase. Under the terms of the deal, JPMorgan gave Colony $514 million in cash. Colony retains ownership and management of the properties, but JPMorgan “hereby absolutely and unconditionally” holds the deed of trust until the loans are paid back. It’s one of six mortgage-backed securities controlled by Colony, with a total debt of $3.2 billion, all held by JPMorgan Chase. The deals present a win-win for Colony. Barrack and his investors are able to pull money out of the homes and at the same time enrich the company’s directors and shareholders – all while the tenants pay back the loan. Colony did not address Reveal’s question about its bundling and securitizing of homes. The Urban Institute’s Laurie Goodman praised the deals, arguing investors like Barrack deserve a chance to get some of their money out. But many housing advocates worry these financial products are changing the way landlords behave. The deals also have drawn the attention of consumer groups and government regulators, who are worried about a repeat of the housing bust. Back then, banks bundled bad loans into giant securities. When home values started to tumble, the securities failed, dragging the economy down with them. At issue was the system used to value the homes. Green River Capital was relying on something called “broker price opinions” – where licensed real estate brokers estimate the value of each home based on photographs and their knowledge of the local market. The son of a Lebanese grocer, Barrack presents himself as a renaissance man: an enthusiastic horse polo player, a Bordeaux-style winemaker and an avid surfer not afraid to be photographed shirtless alongside actor Rob Lowe. For decades, his primary business has been profiting off other people’s pain. He bought the Neverland Ranch from Michael Jackson shortly before the King of Pop’s death in 2009, and became famed photographer Annie Leibovitz’s sole creditor when she was threatened with bankruptcy in 2010. His biggest paydays have come when he bet against conventional wisdom. In the aftermath of the savings and loan scandal in the 1980s, he teamed with Texas financier Robert Bass and then-upstart investor David Bonderman to buy a portfolio of bad loans held by American Savings, a failed thrift that had been taken over by the FDIC. They then sold the loans back to their original borrowers, turning a $400 million profit, according to Fortune. Barrack saw the housing bust coming, predicting in the 2005 magazine profile that the real estate market would collapse just as the dot-com boom had fizzled a few years before. When the recession hit, he was ready. Between 2008 and 2013, Colony Capital became the largest purchaser of distressed assets from failed banks under the FDIC’s structured transaction sales program, buying $2.3 billion worth of commercial and residential real estate loans for less than 25 cents on the dollar. In 2012, at the bottom of the housing bust, Colony began buying up houses, too, turning them into rentals. The government helped him get started. In November 2012, Barrack’s firm went into business with Fannie Mae, buying an equity stake in 970 foreclosed homes that had fallen into the hands of the government-controlled mortgage company. Congress had chartered Fannie Mae back in the New Deal to help Americans buy homes, but with the country awash in foreclosure, Fannie Mae had become the unwelcome owner of more than 100,000 of them, many of which were sitting vacant. So the Obama administration, through the Federal Housing Finance Agency, directed Fannie Mae to start selling bundles of properties to large investors. Barrack was involved in the very first deal. Colony paid $35 million for an ownership share of the bundle valued at $157 million. Under the terms of the deal, Colony was allowed to keep a share of the rents along with a management fee in exchange for its management expertise. Together with Fannie Mae, Colony still owns and runs many of these homes. Over the next three years, Barrack’s company acquired 20,000 homes. Its purchases focused on suburbs in the Sun Belt – from Los Angeles and Phoenix to Atlanta and Miami. Last year, Colony merged with one of its rivals, Starwood Waypoint, creating an empire that manages more than 35,000 homes. The combined company now controls more than $6 billion in residential real estate, most of which used to be occupied by owners foreclosed on during the Great Recession. In interviews, most tenants told Reveal they had no idea who owns their house. The one name they will never see on paperwork is Colony. The combined company’s forward-facing brand is Waypoint Homes, so tenants pay their rent to Waypoint and call Waypoint’s toll-free 800 number when something breaks. But if they get hit with an eviction notice or want to take their landlord to court, they find Waypoint owns no property. The homes’ legal owners, mentioned once across the top of the lease, are spread across dozens of limited liability companies, many of them named for mortgage-backed securities, registered to suites in suburban office parks in Wilmington, Delaware. And it’s the lawyers for those companies who file eviction notices when Colony’s tenants fall behind. “They’re the ultimate absentee, far-removed, out-of-state landlord,” said Michael Lucas, deputy director of the Atlanta Volunteer Lawyers Foundation, which represents tenants pro bono in Colony’s largest market. He also co-authored the Federal Reserve Bank of Atlanta report on evictions by corporate landlords. Makita Edwards’ experience is instructive. Last September, the 25-year-old mother, who dealt with unreliable heat and a collapsed ceiling fan, fell behind on her rent and received an eviction notice. If she wanted to stay, the attorney for Colony’s company said in a court filing, she would need to pay not only her past due rent, but also a $95 late fee, $60 in court costs and a $25 charge for the process server who delivered the eviction notice. She paid those charges, but her family was already living on the edge and spending the extra $180 made her late on October’s rent, leading to another round of additional charges. Over the next six months, her family would pay more than $1,000 in fees. Colony’s stock filings show the company last year made $14 million on fees and another $12 million on tenant clawbacks, including seized security deposits. Stock filings also paint a picture of a firm that makes money off turnover. Nationally, the company’s stock filings show a turnover rate of 34 percent, with rents going up faster for units that turn over than those where a tenant remains. Vacancy rates are minimal, just 4 percent, giving tenants little leverage if they want to fight. 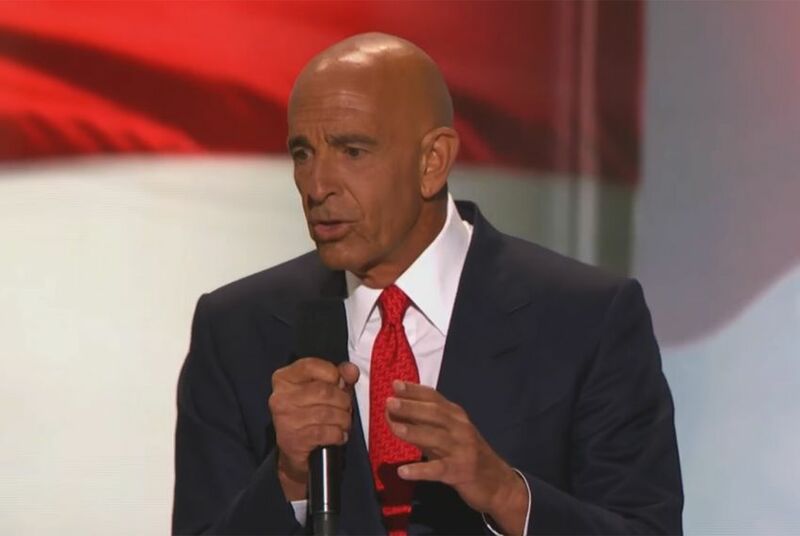 As for Tom Barrack, he’s already cashing out. When it merged with Starwood Waypoint last year, the combined company went public, with Barrack and his investment firm, now called Colony NorthStar, as its largest shareholders. Since then, Barrack has been selling his shares. Last October, a month before Trump was elected, Barrack off-loaded three-quarters of his stock in Colony Starwood Homes, then valued at $728 million. Then, this spring, Barrack and his investment firm cashed in about half their remaining stock. On a single day in March, Barrack personally made $127 million. 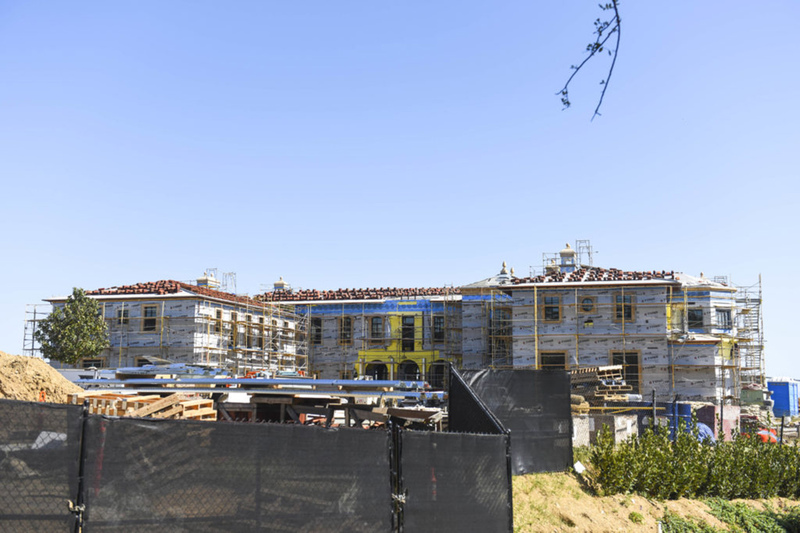 And in the hills of Bel Air, Barrack is building a 77,000-square-foot mansion, with breathtaking views of the Pacific Ocean. When it’s finished, the estate will have three fountains, two swimming pools, a tennis court – and 10 bedrooms just for the help. There are rumors that he’s building it for a Qatari sheikh, but Barrack’s name is the only one on the plans filed with the City of Los Angeles. At two stories high, the security gatehouse at the base of its driveway is larger than many of the 31,000 homes his company acquired after the bust. Disclosure: JPMorgan Chase has been a financial supporter of The Texas Tribune. A complete list of Tribune donors and sponsors is available here.